CricHQ is a cricket company that is focused on revolutionizing the sport of cricket through the use of technology. Their cricket community uses an app that is doing its part to revolutionize the game of cricket via a robust competition management system module (CMSM) loaded with useful tools and social media functionality, along with the ability to follow grassroots games and clubs. CricHQ was founded in April 2010 by Simon Baker, Stephen Fleming and Brendon McCullum, and launched its prototype app six months later in New Zealand. Today, CricHQ has 58 staff in seven countries and continues to expand. Over 80% of CricHQ staff play competitive cricket. That passion is complemented by deep business experience on their Board. CricHQ is made for cricket by cricketers. It’s popular because it includes everyone. They recognized from the outset that CricHQ needed the grassroots support of kids, fans, umpires, coaches and scorers as much as it needed the support of clubs, professional players, administrators and national and international governing bodies. They have 500,000 CricHQ profiles in their network. This introduction CricHQ video below gives a unique insight into the CricHQ technology platform, documents CricHQ’s journey so far and portrays CricHQ’s the vision for the future. The CricHQ App is a fantastic sports technology product that records cricket games played in India, England or Brazil, by kids on a dirt field, or by professionals playing on Boxing Day, just the same. The app, which can be installed on both IOS and Android devices captures not only the fundamental details such as runs, wickets and dot balls, but also batting and bowling wagon wheels and bowlers pitch maps. The CricHQ app is available, free of charge, on the iTunes store and the Android marketplace and can be downloaded for use on the iPhone, iPad, iPod Touch or any Android device. 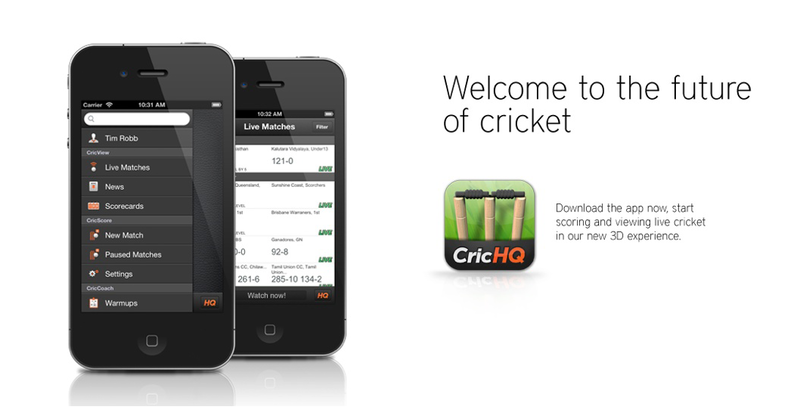 All matches scored on the CricHQ App can now be displayed on CricHQ LIVE! All you need is an internet connection and your supporters can tune in to your progress, either from the CricHQ app or CricHQ.com if they can’t make it down to the ground. With the push of a button any match can be turned onto Live scoring – giving anyone in the world the ability follow along in real time if they can’t make it to the match. Match reports are created that are full of big data that coaches, scorers and umpires can engage with to find valuable insights into a game or season. CricHQ’s competition management system is able to seamlessly integrate with the CricHQ technology suite, making it the best way to utilize the data captured while scoring a match on the CricHQ app. The all new CMSM online system can register players, manage clubs and teams, create draws, allocate fixtures and grounds, upload and share points and results, follow statistics, leaderboards and MVP, and create, analyze and communicate with a database. 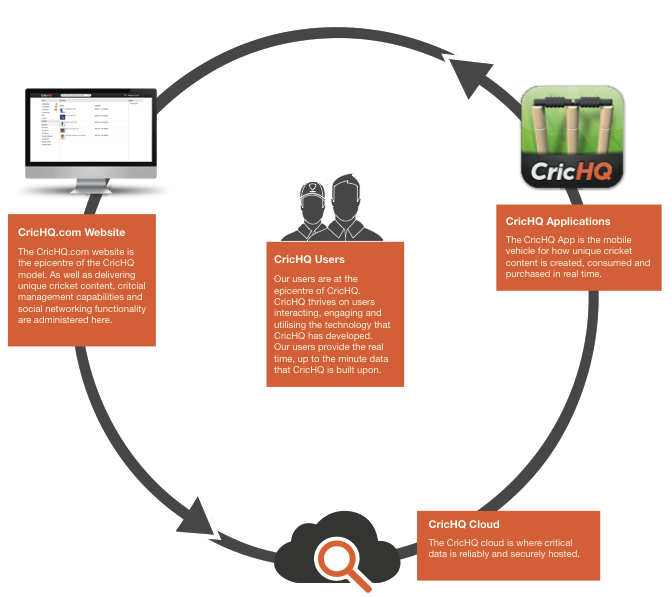 The CricHQ Cloud is where critical data is reliably and securely hosted for 24-hour access. Chief Developer Leo Gui said there were “many late nights and long days for the development team getting the technology ready for the new season.” The result was the release of CricHQ app 4.0 – the first cricket app with cloud capability. Scorers can now turn up on match day, find the opposition team on the cloud (provided they have an internet connection) and download the team list to their smart device. Over an entire season this feature will dramatically decrease the set up time in creating fixtures. And it’s not just players that can be found on the cloud, but also fixtures, umpires, teams and venues – all the information you need to start scoring a match. In addition to saving time, the cloud technology also opens the way for user collaboration. Once clubs, teams, players, venues and fixtures have been added to the competition management system, this information can then be accessed by the verified match scorers on the day. This means players, teams, match venues and fixtures no longer need to be manually entered each time a match is played. All these details can simply be downloaded from the CricHQ cloud straight to the CricHQ scoring device, significantly decreasing the time it takes to set up a new fixture. At the end of a day’s play, when the stumps are drawn the process is the same. With the click of a button all of the match details are uploaded to CricHQ data warehouse. Once the competition administrator has verified the result, the match result automatically updates the competition points table along with the public being able to view the match details. This has opened the door for players, coaches and fans to easily find and view CricHQ’s match statistics. These include: wagon wheels, match reports and the soon to be released player profiles. This season Auckland Cricket has placed an iframe on their website that displays all the matches managed by the CricHQ competition system – making it easy for viewers to keep up to date with the weekends results. CricHQ TV, the latest product to be released by CricHQ has been developed to satisfy the growing demand for fans to get a behind the scenes look into the lives of the world’s top cricketers. CricHQ TV, the latest product to be released by CricHQ, has been developed to satisfy the growing demand for fans to get a behind the scenes look into the lives of the world’s top cricketers. In partnership with Google, CricHQ TV will feature a live internet broadcast aspect, streaming video footage to an audience of millions. Content, uploaded by the players themselves, will be supported with statistics and data from CricHQ. Subscribers will also be able to upload their own video content. Broadcasts can be professionally produced or recorded directly from a smartphone or tablet and will be promoted through the CricHQ Social Network. CricHQ Cricket Chat – 1st NZ vs. England ODI Hangout: http://youtu.be/M8AM0A50YYY. Today, CricHQ TV launched with a series of Google Hangouts on Air titled “CricHQ Cricket Chat.” These live streamed events will take place after each of One Day Internationals between New Zealand and England. These On Air events will give players involved in the series the unique opportunity interact with their biggest fans via the Google Hangout technology. CricHQ Cricket Chat will feature an ex-Black Caps who is now a leading cricket commentator, Simon Doull, as host. To register for the 2nd CricHQ Cricket Chat on the 21st of February click this link – http://crichq.me/hangout2. The list of CricHQ users and official endorsers is impressive. Pro players such as Stephen Fleming, Brendon McCullum, Muttiah Muralitharan, and Chris Martin, are featured on their web site. The national governing bodies at the ICC, EBC, PCA, Cricket Ireland, USACA, NZCPA, and ACA, are the technologies official endorsers. Partnerships have been formed with ICC Europe, and ICC East Asia Pacific, Cricket Canada, SACA. In addition to these cricket partnerships CricHQ has formed strategic partnerships with educational and research and development institutions such as Massachusetts Institute of Technology (MIT) and Ministry of innovation, Business and Employment (MoBIE). CricHQ has also formed relationships with Amazon, Google and YouTube. The cricket community might indeed be within the CricHQ app. The CricHQ sports business model is tech-centric and involves one of the most popular sports on the planet, cricket. They have influential endorsers and partners on board. This app has plenty of features that a Sports Techie cricketer will find useful, especially recording and analyzing game play and the ability to share any cricket experiences or stat throughout your social networks. The U.S. may not be a huge part of this cricket community yet, but we do have our core of super fans, collegiate players, and immigrants who bring their love of cricket here into our neighborhoods. The United States of America Cricket Association (USACA) is a CricHQ partner. Many cricket fans, scorers and coaches worldwide will eventually gravitate to using the CricHQ app because of its grassroots elements which help everyone do their part to participate, share and grow the sport. The CricHQ partnership with Google and the new CricHQ TV is significant, Sports Techie. Google Hangouts on Air are titled “CricHQ Cricket Chat.” I like the activation of CricHQ TV by using Google Hangout technology on YouTube, it makes good sportsbiz sense. Get started by watching CricHQ LIVE! : http://www.crichq.com/live_matches, and by friending CricHQ on Twitter https://twitter.com/crichq, and following them on Facebook http://www.facebook.com/CricHQ?fref=ts. Sports Techie, Understand that cricket is popular for a reason, it’s a sport that athletes play all over the world with long-standing tradition and history. Millions of fans truly enjoy this International sport. Corporate sponsors are involved with the NGB’s and Leagues aligning marketing plans to assist with grassroots messaging. The biggest cricket games are broadcast to millions of viewers much like the Super Bowl. I have not seen a game in person but I have watched plenty over the Internet, especially on YouTube so I feel like I understand the game fairly well. That said, it is a tremendous honor for Sports Techie to be followed by the ICC on twitter. We are happy to be a positive and steady influence on cricket while being part of the overall cricket community. By delivering sports tech products that are created with the intent of fostering a community of fans, cricket is bigger and better thanks to CricHQ, an innovative sports technology company. One touch scoring, no mistakes, the CricHQ app makes scoring fun and easy.